It is finally here after two years in the making! 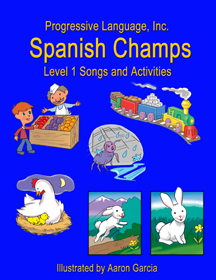 Our beautifully illustrated song book brings to life all 23 songs in the Spanish Champs Level 1 song collection. This book not only shows what each of the songs means through colorful illustrations, but also explains how to use each song to learn Spanish, including all motions to the songs. This book is the fruit of more than five years of teaching experience using the Spanish Champs songs with children of all ages (and many adults!). This book is an excellent resource for both home and classroom. Click the button below to add the Spanish Songs and Activities Book to your wish list.